The Florida Panthers head to Bell Centre to take on the Montreal Canadiens on Friday, September 29, 2017. The opening line for this contest has the Panthers at +110 and the Canadiens at -135. Florida had a record of 35-36-11 last year and away from home they had a record of 16-17-8. They were 6th in the Atlantic Division. They tallied 210 goals and surrendered 237 goals for a point differential of -27. For the year they had an ATS mark of 35-47-0 and an over/under record of 36-36-0. Montreal finished with a record of 47-26-9 including 24-12-5 on home ice last year. They were 1st in the Atlantic Division. They scored 226 goals and gave up 200 for a goal differential of +26. Their record against the spread was 49-39-0 while their over/under mark was 31-42-0. 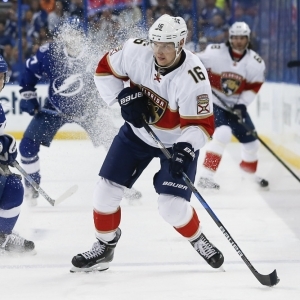 Aleksander Barkov scored 52 total points last year for the Panthers. He had 21 goals last season with 142 shots on net giving him a shooting percentage of 15%. He had a total of 31 assists on the year and averaged 19.4 minutes played per contest. Jonathan Huberdeau averaged 17.9 minutes of ice time per game last season. In that time he had a shooting percentage of 10% by tallying 8 goals on 77 attempts. He had 16 assists giving him a total of 24 points on the year. Roberto Luongo had 17 wins and 15 losses last season in goal for the Panthers. He had 1,217 shots against him and he surrendered 104 goals. He made 1,113 stops for a save percentage of 92%. Jonathan Drouin had 53 total points last season for the Canadiens. He had 21 goals last year with 177 shots on goal giving him a shooting percentage of 12%. He had a total of 32 assists on the year and averaged 17.7 minutes played per contest. Max Pacioretty averaged 19.2 minutes of ice time per contest. In that time he had a shooting percentage of 13% by scoring 35 goals on 268 attempts. He had 32 assists giving him a total of 67 points on the year. Carey Price had 37 wins and 20 losses last season in net for the Canadiens. He had 1,794 shots against him and he gave up 138 goals. He made 1,656 saves for a save percentage of 92%. The Panthers had 81 total points last year, which was 23rd in the NHL. They scored 210 goals while giving up 237 scores, which had them ranked 23rd and 11th respectively. They had 265 power play chances and scored 45 goals on those opportunities for a percentage of 17%. That was 23rd in the league. The Panthers gave up 245 power play opportunities and surrendered 36 goals on those chances for a penalty kill percentage of 85%, ranking them 2nd when short-handed. They averaged 32 shots per contest and as a team shot 7.94% for the year. They allowed 32 shot attempts to their opposition per game and had a team save percentage of 91%, which was 14th in the league. The Canadiens were 8th in the league with a total of 103 points last season. They had 45 power play goals on 230 chances for a percentage of 20%. That was 13th in the NHL. They gave up 249 power play opportunities and surrendered 47 goals on those chances for a penalty kill percentage of 81%, ranking 14th overall. As a team, the Canadiens were 16th with a total of 226 goals scored while they gave up 200 goals last season, ranking 28th in goals against. They averaged 30 shots per game and had a team shooting percentage of 9.19%. As a unit they gave up 30 shots per contest and had a save percentage of 92%, putting them 6th overall in the NHL. Who will win tonight's Panthers/Canadiens NHL game against the spread?